Idle Speculation Concerning BIM in Brisbane! BrisBIM Launches! Click on the Application button (big R in the top left! ), then select Options down the bottom, finally select the Graphics tab. Down the bottom is the Temporary Dimension Text Appearance where you can adjust the font size between 8 and 20, and also set the dimension’s background to either opaque or transparent. 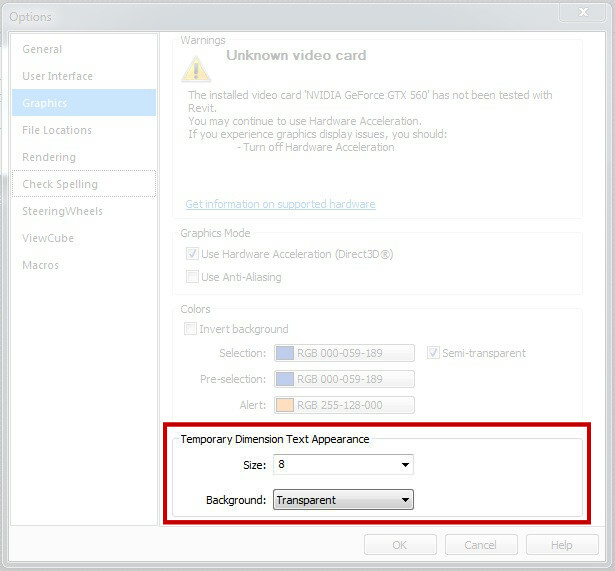 Depending on your monitor resolution, this feature can be very useful by making the benefits of Temporary Dimensions more accessible. This is a setting that may also be included in your deployment image with the use of a customised .ini file. betterRevit is all about getting more from your applications!